Psycho Solo Diver – Online Diving Blog and more!September, 2007 | Psycho Solo Diver - Online Diving Blog and more! You are currently browsing the Psycho Solo Diver – Online Diving Blog and more! weblog archives for September, 2007. Water Temperature: Warm, felt like it was in the 60’s. John, Jim and myself took the “Barf Bucket” to our secret location around 8:00 PM. The Island Diver anchored by the Avalon while we were en route. I was just going to go towards shore and cover as much ground as possible. For a split second I thought about calling the dive, until I started seeing lobsters. I ran across a sand shark sleeping on the bottom, a resting guitarfish, a swimming Pacific Electric Ray and pieces of kelp and seaweed that formed the shape of various threats in my mind. I was getting discouraged, but finally caught my first lobster half way through the dive, followed shortly thereafter by a second one. The boat was never too far away, but two of the four lights had burned out while we were under, so the boat appeared very different when I broke the surface. We were the only boat in that area. Everyone reached the boat at the same time. Jim caught four, I caught two and John two. Still being tired from this morning and with conditions sort of crappy, we decided to skip the second dive. This morning we saw a group of shore divers and many dozen boats around this area. Tonight, there were many groups of beach divers (you can spot their colored marker lights on shore) and only one other boat. We moved the boat North. John had almost limited on the last dive, Jim had four, Michael Paul I believe caught two. So, John knows were to go? I decided to follow him on this dive. 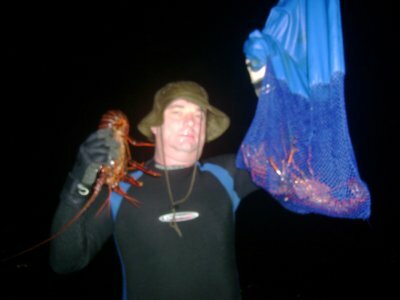 So Michael Paul and I followed John under and towards shore; they caught all their lobsters in about 20 feet of water. 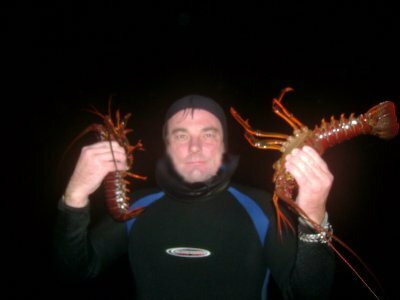 It didn’t take long before my obsession with catching lobsters took priority over following John. At least I was headed in the right direction. 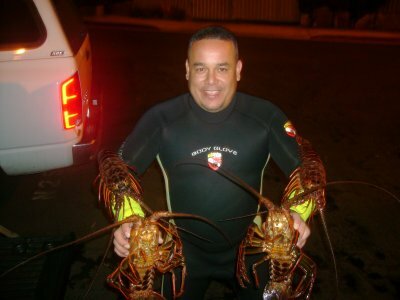 I grabbed for maybe four nice sized lobsters, only catching two. One of the springs on my game bag had broken off, so the bag didn’t stay closed very tightly; I held the bag shut while swimming. I surfaced a few times to get my bearing. Thankfully, the boat was never very far away. I ended the dive with two lobsters. By this time it was about 3 AM in the morning. Everyone was a little tired and everyone except John was a little motion sick. I never get sea sick, but I wasn’t feeling too great this morning. We didn’t crack open any beers until we were in the harbor on flat water. Jim shows off his bugs. Here’s my stash of lobsters for the morning! We’re planning on going out again tonight.